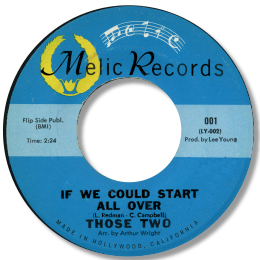 What a lovely slice of melodic West Coast soul If We Could Start All Over is from this duo. Arranger Arthur “Sleepy” Wright mixes horns, strings, piano and vibes in a fine combination while the two singers come in with clear harmonies and a righteous lead. Could they be Messrs Redman & Campbell the writers? UPDATE ~ Gary Myers has wrriten to confirm that the singers are indeed Mssers Redman & Campbell. He says - "Lovelace Redman (I think it was supposed to be Redmond) & Carl Campbell were previously 1/2 of the Supremes Four, a Milwaukee group covered in my book, "On That Wisconsin Beat"'. He adds - "As you may know,Lee Young, who produced that "Those Two" 45, was a drummer and the brother of jazz great Lester Young. Lee died several years ago." I'm grateful to Gary for addingthis info - you can find his books here.